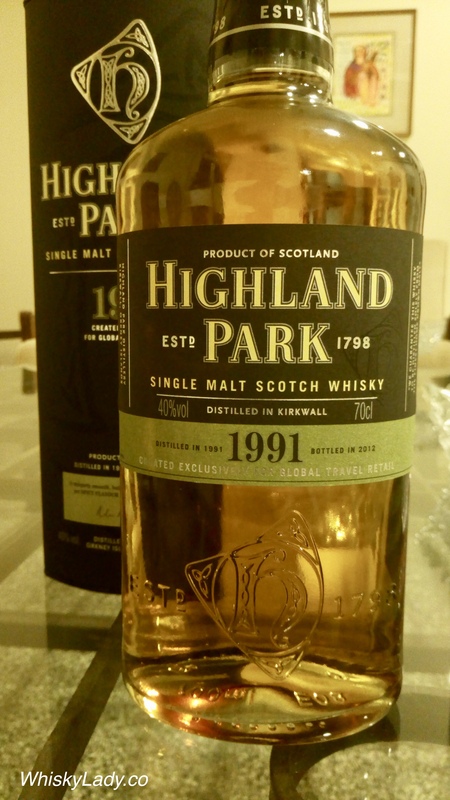 Once upon a time, Highland Park was a ‘gateway’ whisky for me… more specifically the 18 year which opened my palate and senses to the character and complexity of a decent dram. Shift ahead a few years to a period where Highland Park made to the switch to vintages and no age statement “Heroes”, “Warriors” and “Legends”… with the 1998 and Einar disappointing while the Thor surprising and pleasing. Enter the 21 year old that is known by its vintage 1991. Introduced to travel retail in 2012, the thinking was as each vintage ran out, it would be replaced by the equivalent next vintage i.e. this one replaced the 1990 vintage and the expectation was by 2013 the 1992 would be released and so forth. Except a funny thing happened along the way… for Highland Park, after a few years the vintage approach didn’t “stick”… quietly without fanfare the duty free shelves holding vintage whiskies were slowly replaced by age statements. Which means our patient whisky host had managed to keep one of the few 21 year olds from the vintage marketing “experiment”. As we opened this bottle that had sat patiently waiting its turn for nearly 6 years, talk turned to our varied experiences with Highland Park – good, bad, brilliant and much in between. We really enjoyed it – very yum! And more importantly, had all those elements many of us once enjoyed in a Highland Park – character, complexity and just a darn good dram. Even more remarkable is that it was full flavoured at only 40%. While none of us were tempted to add a splash of water, these days anything lower than 46% tends to come across as a bit “watery” – not so with this Highland Park. We set it aside for some time and the revisit just confirmed it is a lovely whisky and a clear winner for most. However when it came time to pair with cigars, this would not be my pick… I’d prefer to simply enjoy it on its own. What would this set you back? It was last seen for about £120 on auction. This entry was posted in Island, Scotland and tagged Duty Free, Highland Park, Highland Park 1991, Highland Park 21 year by Carissa Hickling. Bookmark the permalink.